Weekly or biweekly pickup. Limited to a 96 gallon container (provided) and one 32 gallon container. Place at curbside the night before to be sure your trash is never missed. Yard Waste limited to 4 bags per week. Brush and branches, tied in bundles not over 4 feet long and 60 lbs. Limited to 3 bundles per week. Senior citizen and military discounts available. Temporary stop service. Let us know if you are going away and we will temporarily stop service. Temporary or Permanent small dumpsters. Available in size 2, 3, or 4 yards. Call for availability and costs. The items below are unacceptable for trash and recycling. These items can be disposed of at the Household Hazardous Waste Facility at the Lancaster County Solid Waste Management Authority at 1299 Harrisburg Pike in Lancaster. Automotive Fluids Automotive Batteries – Household batteries are to be put in a clear ziplock bag and set on top of the trash can. Fluorescent Bulbs Liquid Paint – We can accept paint cans as long as the paint is DRY with the lid off, limit 5 cans per week. Medical waste – Sharps: Call LCSWMA for a free sharps container. Once that is full, we can accept the container with the regular trash. Open M-F 7 a.m. – 4 p.m. In 2013, Pennsylvania passed the Covered Devices Recycling Act. The law prohibits residents from putting any covered device in the trash. A covered device includes desktop computers, laptops, and computer accessories; televisions; and hand-held tablets (Kindle, iPad, etc.). As a trash hauler, it is illegal for Econ to take any covered device a customer has put out. Only companies with a specific electronic recycling license can accept any covered device. Open M-F 8 a.m. – 4 p.m. Saturday 8 a.m. – Noon. Free to all Lancaster County citizens, 10 items max. Click here for the Lancaster County Solid Waste Management Authority’s website for details on the law. 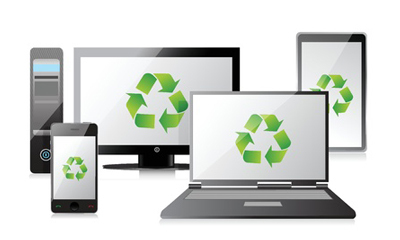 Before you purchase a new device, ask the store if they have a recycling program for the old device. Most big box stores have a recycling program in place.